Few places in the world can rival the beauty of Kelingking Beach on the island of Nusa Penida just off the southeast coast of Bali. In fact, we can say with full confidence that a visit to Kelingking Beach is an absolute must despite the somewhat scary journey it takes to get there. This secluded sand beach often referred to as T-Rex is considered to be one of the best beaches in Bali, and definitely the main highlight of Nusa Penida. Here is everything you need to know about visiting Kelingking Beach! Before we get into details about Kelingking Secret Point Beach, we thought we’d give you brief rundown about Nusa Penida. As mentioned, Nusa Penida is an island off the southeast coast of Bali. The island is known for its extreme beauty and the fact that it’s the bigger and much less developed brother of Nusa Lembongan and Nusa Ceningan. Being the fact that Nusa Penida is a volcanic island, it offers a unique and very exciting landscape with dense tropical jungle, rolling hills, breathtaking views, and some of the most scenic beaches in the world. The island is still quite untouched and underdeveloped compared to the more popular Nusa Lembongan. That means that accommodation and food options can be a bit more limited. But on the other hand, the beaches are secluded and far from over-crowded. Also, compared to the Gili Islands, Nusa Penida is larger in size which means that there is a lot of ground to cover and tons of amazing beaches to explore without hordes of tourists. And while there are many good reasons to visit Nusa Penida, Kelingking Beach is the must-see attraction of the island. In order to get to Nusa Penida, one has to take a ferry or use some sort of boat service. Many people visit Nusa Penida from the neighboring Nusa Lembongan and Nusa Ceningan. If you’re coming from Bali the easiest way is to take a boat from Sanur. A speed boat from Sanur to Nusa Penida takes about 45 minutes and costs anywhere between 125,000 IDR to 300,000 IDR depending on the company you book your ticket with. You can also arrange transportation from anywhere else in Bali such as Ubud or Canggu. In addition, Nusa Penida is connected to Bali’s neighbor Lombok as well as the Gili Islands, and you should have no problem of reaching the island regardless of where you are. The roads on Nusa Penida are known to be very basic and rocky, and the only way to get anywhere on the island is to drive. Therefore, you will need to have access to a motorbike as well as enough experience to drive on some pretty scary roads. It cost roughly 75,000 IDR ($5) per day to rent a scooter on Nusa Penida. Just beware that most of the rental services don’t provide helmets so you should bring your own. Driving without a helmet is never recommended and the broken and often times steep roads on Nusa Penida make this an even more dangerous matter. Please trust us, don’t rent a bike on Nusa Penida without a helmet! Pro Tip: You should never travel without travel insurance, and you need to make sure you’re covered for adventures like this. We personally use World Nomads and have had a great experience with them over the past couple of years. On the way to Kelingking Beach, you will first park your bike at the car park close to the point where you can overlook the beach and see the T-REX cliff formation that has given the beach its nickname. A parking permit cost 10,000 IDR ($0.70). We suggest you spend some time here to enjoy the view and properly hydrate before preparing for the steep climb down to the water. You will also have the opportunity to eat a light local dish here, but don’t expect too much in terms of stores so bring water with you. The climb down takes around an hour and is extremely steep. Please use caution and wear a good pair of sturdy shoes. During the climb down to the beach, you will be rewarded with some of the best views anywhere in Bali and there are several Instagram-friendly viewpoints along the way. At the bottom of the stairs, you'll find a secluded and absolutely gorgeous white sand beach lined with palm trees on one side and turquoise waters on the other. Due to the fact that Kelingking Beach is located quite far away from most accommodation on Nusa Penida, we recommend you make a day trip out of it. Chances are also high that you will want to lounge for a while and enjoy your time at this stunning beach, and the last thing you want is to feel stressed about leaving. As mentioned, Kelingking Beach is located on the west coast of Nusa Penida and there are two ways to get there. Most people rent a scooter or motorbike and drive there themselves, although the roads are covered in potholes and are completely broken for most of the way so you need to be comfortable with that. The other option is to join a Nusa Penida tour that will bring you to several places around the island. This option is obviously less adventurous but perfect if you’re not able to make the drive yourself. Note that there are also a range of boat tours that can be arranged on Nusa Penida and that will bring you to Kelingking Secret Point Beach and many other beaches. There are many sites to be visited and many beaches to explore so we recommend that you consider staying a few days on Nusa Penida instead of just doing a one day tour. Choose from the best accommodation on the island so that you can live comfortably and eat well between your adventures. Semabu Hills Hotel is one of the highest rated and most exclusive hotels in Nusa Penida. In addition to offering a range of comfortable rooms and suites with ocean views, this hotel can also help you rent a scooter and even sets up tours to Kelingking Beach. Also, we can't think of a better way to rewind after a long day driving down the winding roads on Nusa Penida than watching the sunset from the infinity pool before enjoying a great dinner at the hotel's in-house restaurant. Bintang Bungalow is a beautiful hotel offering rooms, bungalows, and suites with access to a great pool and incredible service. The location of this hotel is great for anyone looking to explore the east coast of Nusa Penida, and they can help you find a good rental service for a motorbike. We like this hotel because it's comfortable yet affordable and it's well-connected to most of the area, making it a good pick for anyone planning to rent a hotel room in Nusa Penida. The Umah Prahu is a beachside and budget-friendly guest house with an almost perfect rating on Agoda. Here you can rent a simple but practical private bungalow only steps away from the beach. In fact, all of the rooms at the Umah Prahu offer a beach and sea view. However, the best part about this guest house is the price and the fact that you can live comfortably on Nusa Penida without breaking your budget. That being said, this guest house is located further from Kelingking Beach making the drive back and forth a bit longer and more demanding. 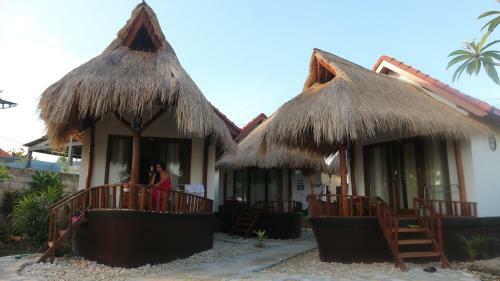 For more hotels and guest houses in Nusa Penida check availability here.